Sometimes it’s just not possible to make it into a yoga studio for a class. The reasons may be due to finances or location or maybe simply fighting traffic to make it to class in time makes the whole experience stressful instead of relaxing! Starting a home yoga practice and making it a regular part of your life can immensely deepen your yoga practice and benefit your health and wellbeing in your daily life. At home you can really develop the skill of listening to your own body. Listening is the practice of yoga; once you listen to your own body, you can ask it to be your teacher. This is where the true knowledge arises. You don’t need any fancy equipment or space to practice yoga at home. You just need to be willing. It is a good idea to have the basics – a yoga mat for a start. Having two blocks and a strap for modifications can be worthwhile but a thick phone book, a folded blanket or towel and a belt can serve the same purpose. When you practice yoga at home, it is your job to make sure that you don’t injury yourself. Keep your space clear of obstacles like furniture and children’s toys. Never force a posture. Don’t compete with your body. Be present. Attempt more difficult poses in class, under the supervision of a teacher. Have a sequence of poses that works for you and practice it consistently. This is a great way to generate a routine. The sequence of poses that you choose should meet your needs, suit your body and its limitations and promote health and wholeness. Repetition allows you to clearly see yourself grow and change over time. When you don’t have to think about what pose to do next, you can just focus on your breath and remain present. This takes you into a deep meditative place, so that you will end your practice feeling clearer and more peaceful. See sequencing at the end of this post for more information. Practice for a minimum amount of time each day. Even if it’s just 15 minutes, make yourself a promise that you will do your 15 minutes. If you do more than that, consider it a bonus. Starting like this will help you stick to your commitment and feel positive about your yoga practice. Have a special place for your practice . Make a specific spot in your home or in your room that is specifically reserved for your practice. You could have a small altar, a special picture or a candle to mark the space as sacred for you and allow your practice to be intentional or dedicated to something or someone that is meaningful to you. When you practice, make practice your sole focus. Turn off your phone and computer. If you choose to play music, make your music suitable for your practice. Try soft instrumental music or play devotional music. Your music choice should not distract you, but help you to move into a deeper, meditative space. Honour your practice time as sacred and important. Invert! Go upside down every day. B.K.S. Iyengar considers headstand and shoulder-stand the king and queen of the asanas. There are many benefits from inverting such as improving the health of your heart, lungs and immune system. Choose a posture that is safe and accessible for your ability. Simply lying with your legs up the wall in viparita karani is a great pose and doable for most people. Take the time to sit and be still. The purpose of yoga traditionally was to support meditation. Always include time in your practice just to be – to breathe and to be present with yourself. Practice a gentle pranayama (breathing practice) or your meditation of choice. 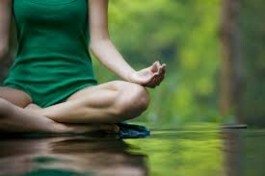 Finding stillness in your practice will make you feel very nourished and peaceful. Just a few minutes of conscious deep breathing can be very powerful. Use as many resources as you can. If you are feeling a little stuck all by yourself, look around for some help and a break in the routine. Attend a few yoga classes or workshops. This will help bring attention to areas of your practice that need assistance, and it will also provide you with new inspiration and motivation for your daily home practice. Learn from reading blogs and yoga websites, or even take an online yoga class. Firstly, ask yourself before you decide what type of practice your going to do – What do I really need from my practice today? You might need a restorative practice to replenish your energy if you are very tired; or you might start with resting poses and move into more challenging postures if you find your energy is increasing. If you feel energetic at the beginning of your practice, you might practice a more vigorous session. Start by getting in touch with your breath. Any simple pranayama or breathing practice such as diaphragmatic breathing or ujjayi is appropriate. This can be done in child’s pose, lying supine or in a seated position. Warm up the spine and backs of the legs slowly with some nice gentle stretches – cat pose, gentle standing forward folds with bent knees, gentle lunges and downward facing dog are good options. Standing and Balancing poses – Surya Namaskar (Sun Salutation) is a flowing sequence of postures which can link many of the standing postures together. Try Trikonasana (Triangle Pose), Parsvokonasna (Extended Side Angle Pose) and Virabhadrasana (Warrior poses). The twisted variations of trikonasana and parsvackonasana are also good options. Open your hip flexors with lunges, lizard or a low lunge with the arms arching up overhead for a nice heart opening sensation. For balancing try Vrksasana (Tree Pose) and other one-legged balancing poses. It is a good idea to include postures that will build core-strength. Try to include some of the following: plank poses – full plank, forearm plank, side plank as well as chaturanga and Navasana (boat pose). When you are properly warmed up, practice backbends. Locust, Bow and Camel are all great poses to build strength around the spine and to really open the chest. Bridge pose and the more advanced Wheel pose (Urdhva Dhanurasana) are also options. Seated poses – Here you can use your blocks or phonebook to elevate the pelvis and protect your lower back. Include forward folds such as Paschimottonasana, spinal twists and hip-openers such as Baddhakonasana and Gomukhasana. Always practice equally on the left and right sides. End with inversions and supine postures or restoratives, which will help quiet the mind and the body in preparation for relaxation. Savasana – Give your body the time to integrate all of the energetic movement that you facilitated through asana. Let your mind and body relax and be receptive. Remember that yoga is a nurturing, self-supportive practice that honours your body and mind. Try to find even ten minutes for yourself in your busy life to take. Start your home yoga practice today home slowly, and continue steadily and gently.